The button to the right will take you to an external link to join the CCAA. Please send the necessary information listed to the left to YvonneAlemanCCAA@gmail.com. You must be a CCAA member in good standing to place this ad. Ad is valid for one year. Please select from the drop down menu and email finished ad or questions to YvonneAlemanCCAA@gmail.com. To receive the discounted member rate, you must be a CCAA member in good standing. After purchasing the ad, please email all requested information above to: YvonneAlemanCCAA@gmail.com. 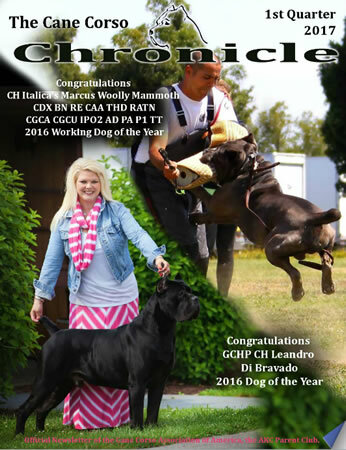 Please include a recommendation from a current client whose Cane Corso you have been hired to train. After purchasing the ad, please email all requested information above to: YvonneAlemanCCAA@gmail.com. The CCAA is proud of its affiliation with the American Working Dog Federation. We are pleased to offer scorebooks through them. Please click on the link to the right to complete the required online application and purchase a scorebook.